Samantha is a feminine given name. It was first recorded in the 18th century in New England, but its etymology is unknown. A suggested origin is from the masculine given name Samuel from the root “Shm Alohim / Shma Alohim > Shemu û'e êl > Shemu'el” and the Greek ánthos (ἄνθος), meaning "flower". 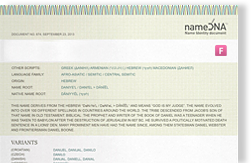 A variant of this speculation is that it may have been a feminine form of Samuel with the addition of the already existing feminine name Anthea. Other suggestions include the Aramaic noun “šemʿanta”, meaning “listener”. Samantha was out of fashion in the United States for the majority of the first half of the 20th century but reappeared among the top 1,000 names for girls in 1958, when it ranked in 998th position, and in 1959 when it ranked in 993rd place. It originated in America in the 18th century but was fairly uncommon until 1964, when it was popularized by the main character on the television show 'Bewitched'.